Still time to get some Christmas postcards in! Hopefully I'll get in another post before the day is over. it sure is moving fast! This is a really neat Christmas card. I appreciate it when the designers choose uncommon colors for Christmas cards. This postcard has nothing written on the back except 1928. 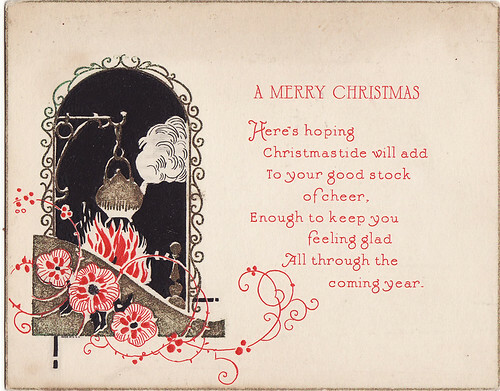 And I like this one becasue of the tea kettle - another unique Christmas image (at least in the U.S.) and that they used the term Christmastide. I always mean to use that more. 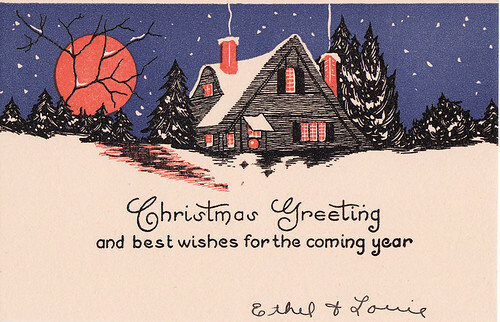 I have seen it on a number of old Christmas postcards. No writing on the back of this one. These are both beautiful, but especially the first one. The font is a perfect match for the graphics too. P.S. Merry Christmas to you!